Here is a great recipe for Caramels that you can sprinkle with sea salt or coat them in chocolate then coat them with a sprinkle of sea salt. Either way they taste great and won’t last very long. Line a 9″ x 9″ pan with aluminum foil and spray with a non-stick cooking spray. In a saucepan combine the cream, sweetened condensed milk, and salt. Over a medium heat bring the mixture to a boil. Then remove it from the heat and cover it to keep it warm. In a large 4 quart pot combine the water, corn syrup and sugar. Place the pot on a medium to high heat, stir the mixture until the sugar dissolves, bring it to a boil and avoid stirring. Brush down the sides of the pot with water to avoid the mixture from crystallizating. Insert a candy thermometer and continue to cook until the mixture reaches 250 degrees. Once the temperature is reached add the butter and the warm cream mixture. Mix carefully stirring everything together. At this point stir frequently to avoid scorching until the mixture reached 245 degrees. This should take 30 minutes and forming a brown carmel color. Pour the carmel into the prepared pan, but don’t scrape the bottom and sides of the pan. Let the carmel sit overnight, remove from the pan and peel off the foil. Use a large knife to cut the carmel to your desire size and coat in chocolate or just sprinkle with sea salt. . Wrap in wax paper that has been cut to size and twist the ends. 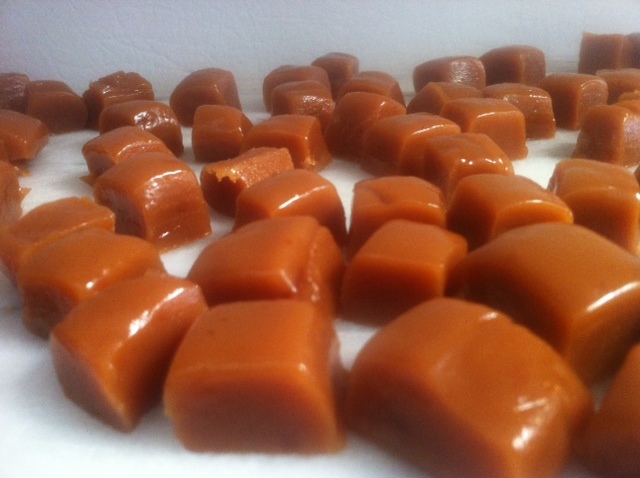 Keep your caramels in and air tight container for up to 2 weeks.